DISCLAIMER: This is a work of revisionist fanfiction for my personal entertainment (and maybe yours). Dragon Age and all related characters and locations are the property of Bioware Inc. RATING: Grown ups. Now Mother Petrice, her ambitions continue, but she skillfully avoids being associated with any of it. 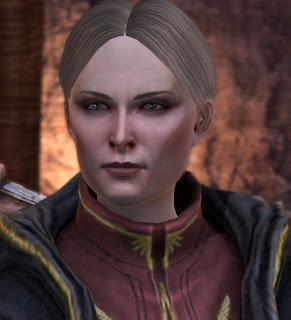 Only Hawke knows the truth, but, if Hawke is against Petrice, she is unable to prove anything to the Grand Cleric, as Petrice simply blames the events of Offered and Lost on Ser Varnell's fanaticism and the growing public hatred of the Qunari, warning that the situation will only get worse if something is not done. The Grand Cleric reminds Petrice that the Chantry does not get involved in political affairs. Hawke can also make the Arishok aware of Petrice's schemes, but he shows no concern. 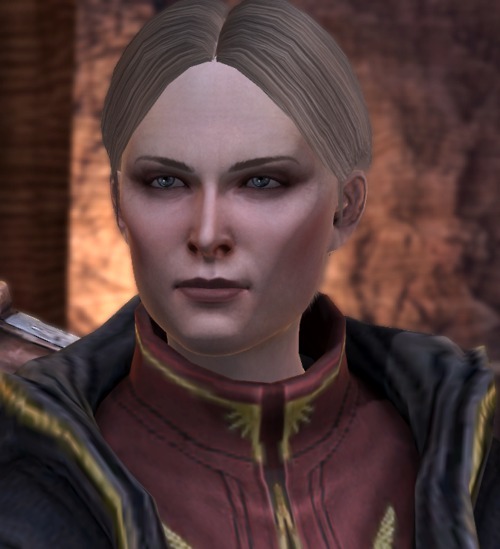 Hawke continues about her business, including the major subplots involving Emeric and the death of her mother and the beginnings of Thrask's mage/templar coalition. 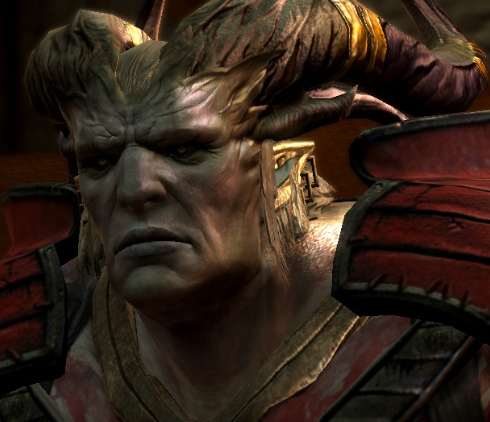 Eventually, Saemus Dumar's conversion to the Qun is brought to Hawke's attention by the Viscount, who requests Hawke's help in making his son see reason. There have been many conversions to the Qun, as learned in Blackpowder Courtesy, but his son's conversion has caused quite the political uprising. Hawke speaks with the Arishok, who cares nothing for the Viscount's concerns. His attentions are on the reason why the Qunari have been unable to leave Kirkwall, which he finally admits to Hawke: the missing Tome of Koslun. He has learned where it may be and demands that Hawke obtain it for him. 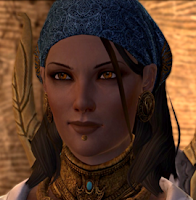 If Isabela was recruited, then she will immediately approach Hawke and explain her part in this and why she needs to get the Tome to Castillon. Events follow, as per To Catch A Thief, with Isabela escaping with the Tome. If Isabela was not recruited, she will appear, defending Wall-eyed Sam, who has the Tome. She will explain her role in its disappearance and a fight will ensue. Isabela will escape with the Tome before Hawke can kill her. When Hawke approaches the gates of the Qunari compound, a messenger from the Chantry informs Hawke that Saemus Dumar wishes to meet her in Hightown near the Chantry that night. The Qunari guard overhears this conversation. Hawke proceeds on to speak with the Arishok, who is obviously displeased with the turn of events and angrily dismisses Hawke. As Hawke approaches the Chantry, she finds Saemus, dead, and Petrice and her brainwashed followers arrive to accuse Hawke of the murder. The Qunari arrive shortly after. If Hawke sides with the Qunari, then the fanatics are killed and Petrice slips away. If Hawke sides with Petrice, then the Qunari are framed and killed and Petrice warns Hawke to prepare for events to come, promising to support Hawke. Later, Hawke finds the Viscount at the Chantry, mourning his son's loss. 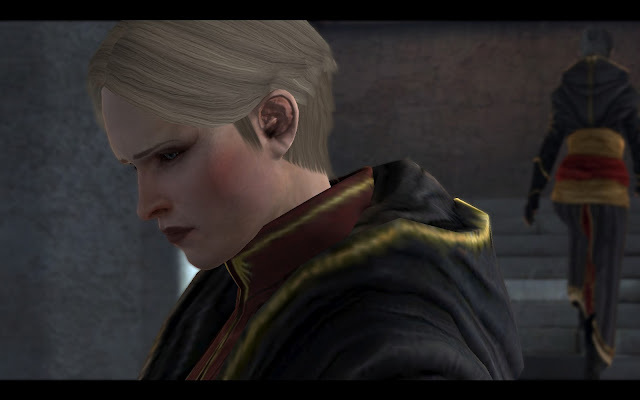 He is too distraught to serve any purpose and Hawke is forced to simply leave him to his pain. Aveline approaches her, informing her that the situation in the Qunari compound is at its boiling point and requests Hawke's help to sooth the Arishok. Aveline and Hawke proceed to an audience with the Arishok. He knows of the Chantry's involvement with Saemus' death and this, along with the theft of the Tome, are the last straw. But because of his respect for Hawke, he allows her one chance to do right by him: bring him the Grand Cleric to answer for the crimes against one of his own. Hawke and Aveline ultimately refuse the Demands of the Qun, and the Arishok launches his attack on them and on the city, gathering the nobles within the Chantry. Hawke and Aveline escape the compound and are joined by their companions. They fight their way to Hightown, encountering Meredith and Orsino along the way. They fight their way into the Chantry, as per Hawke's decisions, and Hawke faces off against the Arishok, who has killed the Viscount and is holding the Grand Cleric hostage. If Isabela has stolen the Tome and returns to Hawke's side, she will briefly imply that it was Petrice whom Wall-eyed Sam was arranging to deliver the Tome to and that learning this made her return, as she was concerned over what Chantry treachery Hawke might fall prey to. If Isabela does not return due to a lack of recruitment or enough friendship/rivalry points, Petrice will enter the Chantry and present the Tome to the Arishok, the implication being that Isabela gave it to her when Petrice made her a better offer. She smugly believes herself to be the saviour of the day, until one of the Arishok's stens recognize her involvement in earlier events and she too becomes a captive. If Isabela is present, Hawke can turn her over to the Arishok for the theft of the Tome (and can even implicate her in the death of Saemus) in exchange for the Grand Cleric and Petrice and a peaceful departure for the Qunari. If Isabela is not present, Hawke will demand the release of the Grand Cleric and can either demand Petrice's release, or accuse her of her crimes. If Petrice is accused, Aveline demands the Arishok submit to Kirkwall's laws and hand Petrice over but he denies her, explaining that Kirkwall's laws are meaningless to him and to the people of Kirkwall. Eventually, dialogue leads to a showdown with the Arishok, alone or against his forces. Hawke defeats him.